Chris Rock. Jamie Foxx. Steve Harvey. Dave Chappelle. Some of the biggest names in American entertainment today all appeared at Raymond Lambert’s club All Jokes Aside, the legendary Chicago showcase for African-American comedy, early in their careers. This insightful memoir follows up on Lambert’s critically acclaimed 2012 Showtime documentary, Phunny Business, and tells the story of his life as seen through the lens of All Jokes Aside—its successes, failures, and lessons learned. By the late 1980s, Lambert was earning a six-figure salary as an investment banker on Wall Street, but dreamed of starting his own company. 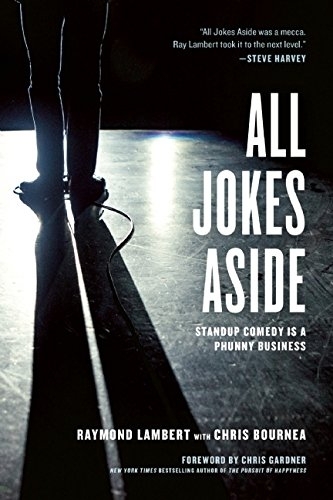 With zero experience, an equally committed partner, and a little borrowed money, he opened All Jokes Aside, and before long was helping to launch some of the biggest names in comedy. This is story of Lambert’s journey, a behind-the-scenes look at the world of show business, and an inspiring tale for any would-be entrepreneur. Chock-full of cautionary tales both humorous and dramatic, revealing details on the early careers of top performers, and tangible guidance on how to build a business from the ground up, this book is a much-needed recent history of black entertainment and a powerful memoir of entrepreneurial ups and downs. Raymond Lambert is an entrepreneur, independent producer, and adjunct professor at Columbia College. He wrote and produced the award-winning documentary film Phunny Business, and is executive producer on “Maya Angelou: The Peoples Poet.” He is the founder of the comedy club All Jokes Aside. Chris Bournea is a journalist and documentary filmmaker. He is a contributing writer for the Columbus Dispatch, This Week Community News, and the Call and Post Newspaper, Ohio’s oldest and largest African-American newspaper. Chris Gardner is the chief executive officer of Gardner Rich & Company, a multimillion-dollar brokerage with offices in New York, Chicago, and San Francisco. Gardner’s memoir, The Pursuit of Happyness, was made into a feature film starring Will Smith in 2006. RAYMOND LAMBERT is a social entrepreneur, independent producer, and adjunct professor at Columbia College in Chicago. He earned writer and producer credits for the award-winning documentary film PHUNNY BUSINESS: A Black Comedy and he is currently serving as a producer on two new documentaries, Maya Angelou: The People’s Poet, and All The Queens Horses with Kartemquin Films. He has served as a consultant on comedy and talent to producers at NBC, HBO, Comedy Central, Just For Laughs, and BET. Lambert earned his B.A. from Morehouse College and an M.B.A from The University of Virginia’s Darden Graduate School of Business.